But what's on offer for those guests with a sweet tooth we hear you say? The Cranachan dessert! Traditionally this sweet treat is made from soft cheese, crowdie, cream and malt whisky however as it is Veganuary we have made this much loved Scottish recipe dairy free! Remove the coconut fat from the tin and place in a separate bowl with 1 tbsp maple syrup, vanilla paste and whiskey. Whisk the mixture until thickened. 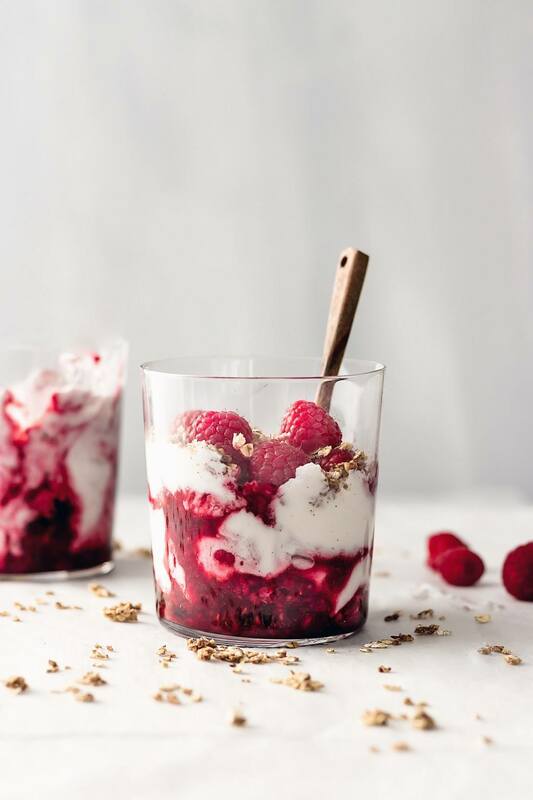 Layer the cream and raspberry into your chosen glass and top with some extra raspberries, granola, chopped nuts and a squirt of maple syrup to finish. Serve your Cranachan dish straight away! If your making them ahead of time store them in the keep in the fridge and add the granola before serving.